You've likely heard about ways to get rid of mosquito breeding sites around your home and landscape, as well as how to protect yourself from being bitten. But what should you do if you own or work at a retail nursery or garden center and want to prevent mosquitoes from breeding at work, as well? Mosquitoes need water to reproduce. 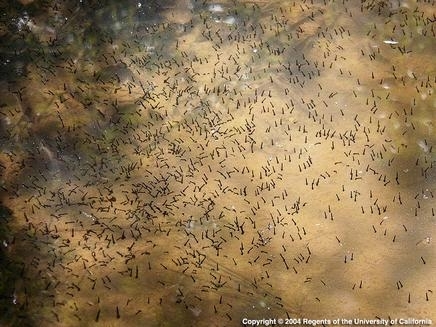 Females lay eggs on or near the surface of standing water. The eggs hatch into larvae that live in water and breathe air through specialized breathing tubes. Larvae eat small aquatic organisms and organic matter, gradually growing until the next developmental stage, called the pupa. 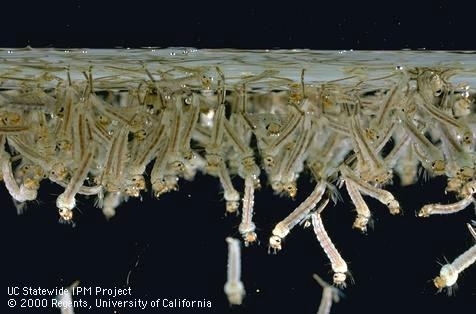 As pupae, mosquitoes are still aquatic and breathe air, but do not feed. They next develop into adults and emerge out of the water as flying insects. Adult female mosquitoes drink blood while male mosquitoes are nectar-feeders. Females of some mosquito species can carry diseases such as West Nile virus, Zika, malaria, St. Louis encephalitis, and typhoid fever. Keep mosquitoes from becoming adults by controlling them in their aquatic stages. In nurseries and garden centers, pots sitting in saucers, trays that hold water, and puddles on floors and under benches are critical mosquito development sites. Limit these breeding sites by emptying standing water that will sit for more than a few days. Frequently empty water from trays, fountains, saucers, or other areas. Check drains to make sure they are not clogged by debris and holding back water. If you have water displays, such as bird baths, fountains, or ponds, you can use products like Mosquito Bits and Mosquito Dunks, which contain the bacterium Bacillus thuringiensis subspecies israelensis (Bti). This is an effective method to kill mosquito larvae with reduced risk to humans, fish, or bees. It's important that everyone working at a retail nursery or garden center understands best practices for mosquito prevention in order to stop mosquitoes from breeding on site. Employees can talk to customers about steps they can take at home to reduce mosquitoes, helping to protect themselves and their families. It is up to all of us to help in the fight to control mosquitoes and limit the spread of diseases they can carry. For much more information about diseases such as West Nile virus, limiting mosquito breeding sites, and protecting yourself from mosquito bites, visit the June 2013 issue of the Retail IPM News http://ipm.ucanr.edu/PDF/PUBS/retailipmnews.2013.jun.pdf and the UC IPM Pest Notes: Mosquitoes http://ipm.ucanr.edu/PMG/PESTNOTES/pn7451.html. Find your local mosquito and vector control agency to learn what's being done in your area to reduce mosquitoes and how your store can help: http://www.mvcac.org/about/member-agencies/.